Saddle is marked on map, north of peak, 5340 m.
Copyright Petter Bjørstad, 2009-2011. Photos also by Rob Woodall. 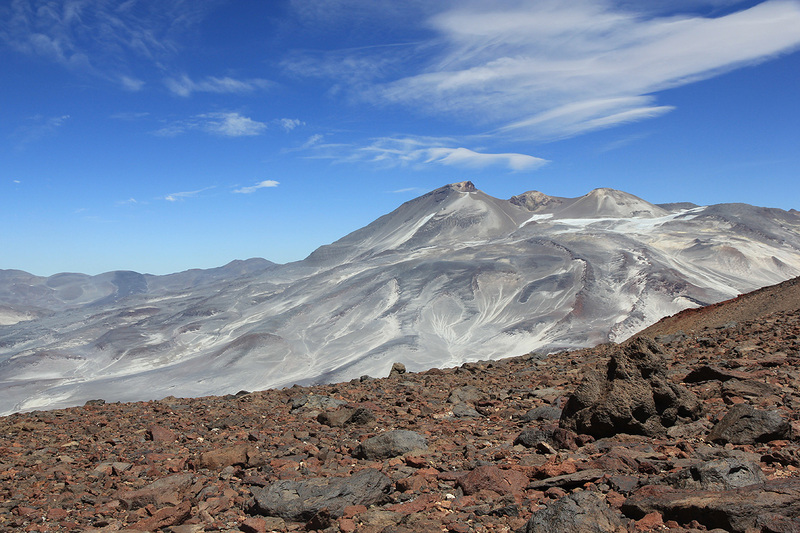 This summit is very close to Nevado Ojos del Salado. 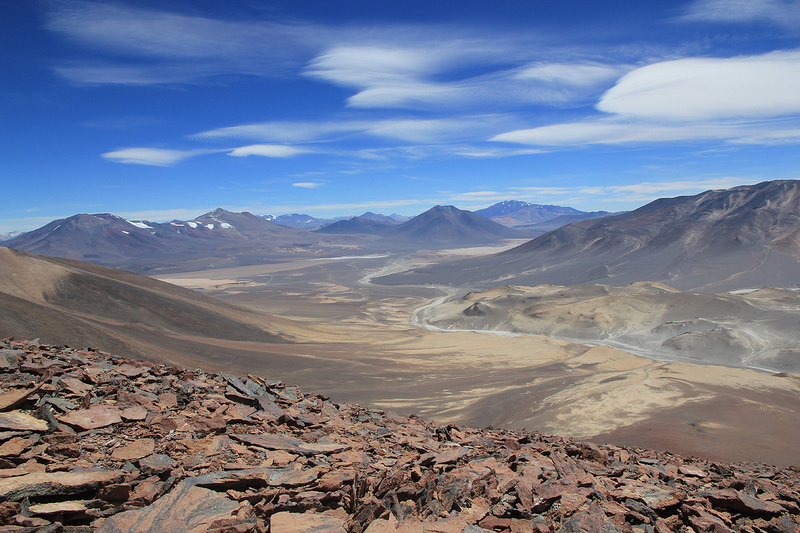 The best access is directly from the dirt road that connects the main highway that runs by Laguna Verde, with the Atacama base camp for Ojos. Drive towards Ojos base camp until location S27:00.103 W068:34.604, elevation about 4760 meter. Park here, this is a good trailhead. Head steeply up the first slope right next to the road in order to gain more gentle terrain slightly higher. Facing the mountain, there are two different options that can be tried. The main north-east ridge is slightly right, a very distinct valley runs towards you on the left side of this ridge. We hiked up the ridge and back down the scree in the valley. The ridge is full of slightly steepish talus and this makes for a fairly cumbersome ascent. Despite the loose scree in the valley, it may still be somewhat easier to hike up this route. If you follow the ridge, you will find that this route climbs a false summit, you will need to descend into a shallow saddle, then climb the proper summit. 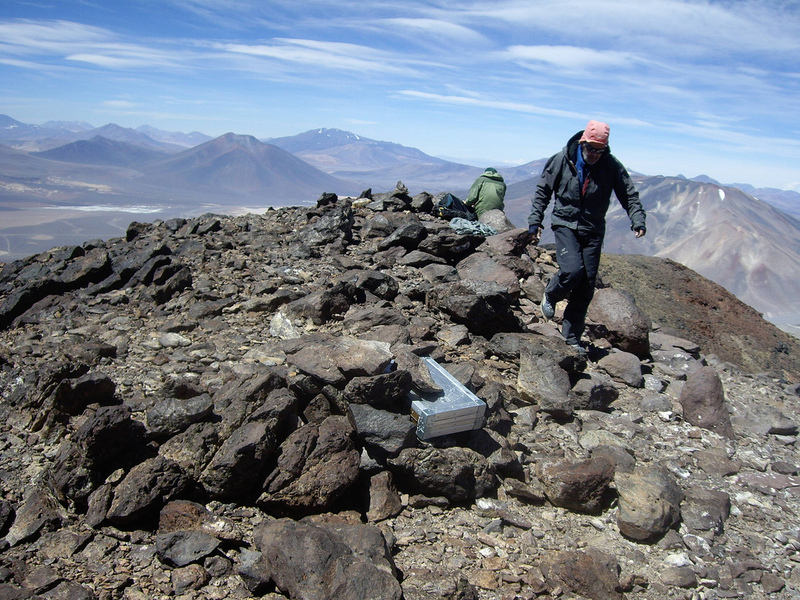 There is a very nice summit register, quite similar to the one at the summit of Nevado Ojos del Salado. 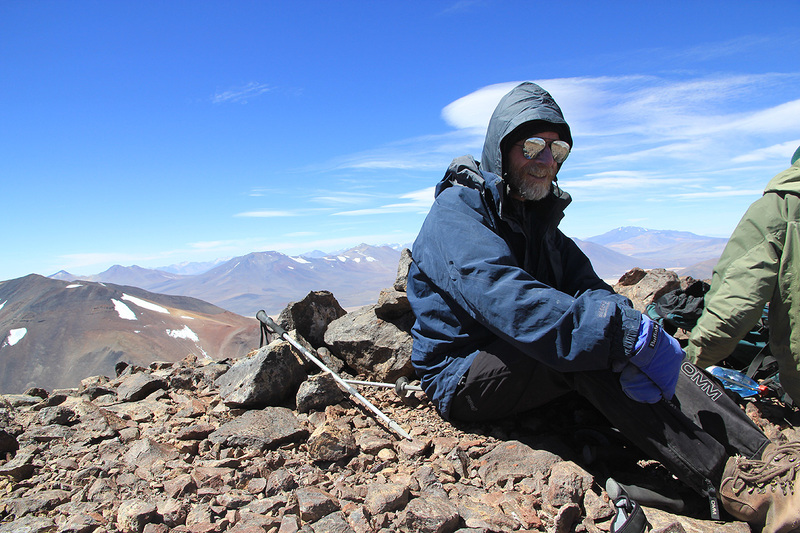 The day after climbing Nevado Ojos del Salado was defined as a rest day. However, since Duane would try for a second time on Ojos (he turned back on our first attempt), we had an extra day that should be used to bag a "bonus peak". 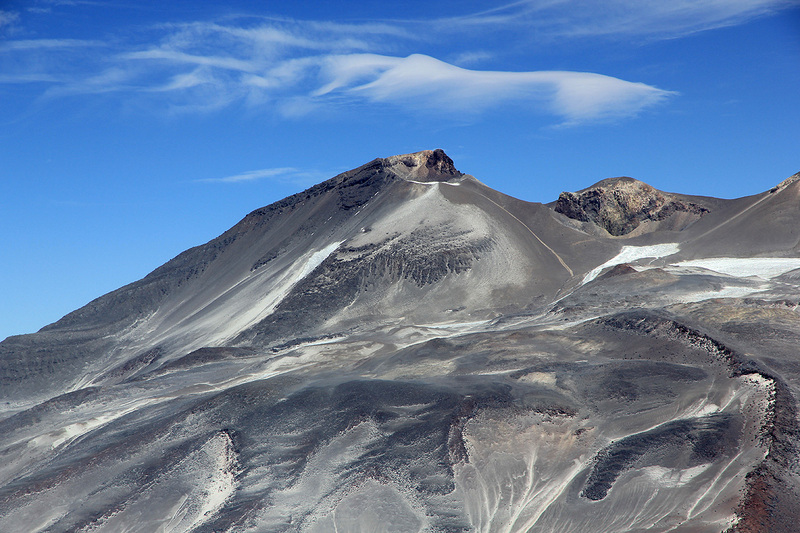 The choice quickly fell on Cerro Vicuñas, being 6000 meter and located conveniently nearby. This hike turned out to be quite hard. In fact, I felt more tired than when climbing Ojos two days previously. We started out from the car at 0905. The footing on the ridge was far from perfect and the wind gradually picked up until it reached storm level. Lenticular clouds could be seen everywhere. 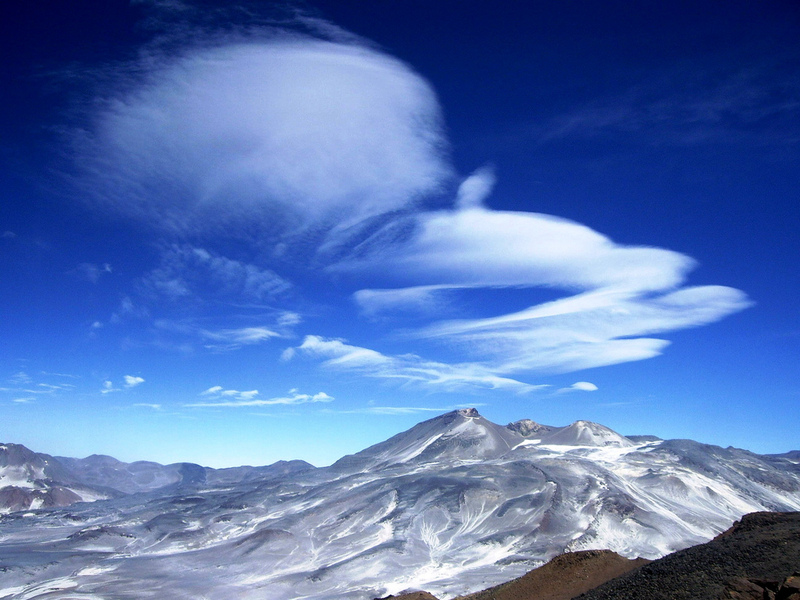 This special type of cloud is a sign of very high winds in the higher part of the athmosphere (like 6000 meter). Quite gusty so we did have a few quiet seconds now and then, but the overall feeling was one of being pushed around more and more violently. 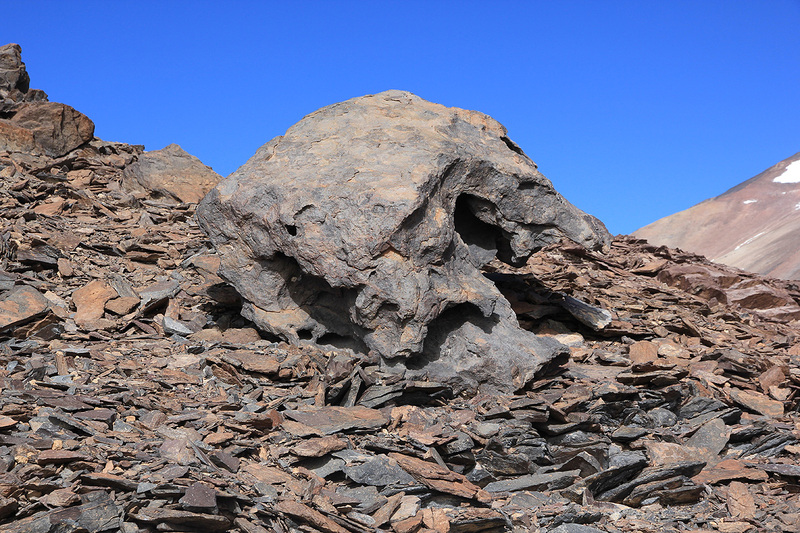 I first reached what I believed to be the summit only to discover a saddle below and a higher peak further along. Disappointing. We descended into the saddle, then climbed to the true summit. I shall admit being happy about the no more uphill today scenario. The time was already 1545, 6.5 hours of ascent. We quickly agreed to descend via the scree valley, a wise move. Leaving at 1600, Rob practiced his fell-running skills and was back by 1700, while Greg and I still made it back well before 1730. 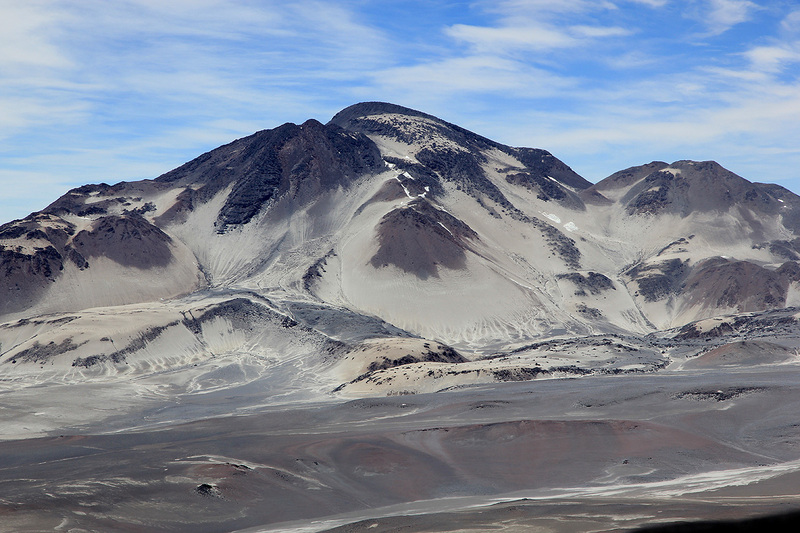 Ojos del Salado as seen from the summit. 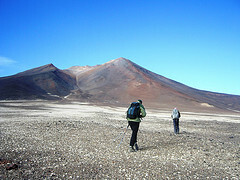 El Muerto, 6488 meter, a neigbor to Ojos del Salado.